Governor Rochas Okorocha of Imo State, south-east Nigeria don pardon some cultists after dem surrender dia arms to security people for Owerri, Imo State. Di governor come commend dem as dem take demsefs go do di surrender say im go carry dia names give federal government for di Presidential Amnesty programme. One of di people wey surrender arms na Emenike Agamu aka 'General Red Scorpion'. Im be di 4th in command for Johnson Igwedibia aka Don Wanny gang wey security people say kill people wey bin dey return from church for New Year day for Omoku, Rivers State. Agamu dey among di suspected cultist wey Rivers State government declare wanted after di New Year day killing. Local media report say di boys wey surrender say di killing of Don Wanny na im make dem surrender as dem realise say crime no dey pay. Dis na after dem confess say na dem bin dey disturb Awarra Court area as well as dey do pipeline vandalism. Dem surrender explosives, rocket launchers and high calibre rifles such as AK47 dem. But Rivers State Governor, Nyesom Wike don hala say di amnesty wey governor Rochas Okorocha grant di boys no get impact for Rivers State, say di boys must come face justice for di crime wey dem do for New Year day. Governor Wike say di N20 million naira bounty wey im place for dia head still stand, say security agencies go dey empowered to bring dem to account for dia crime. "My son go do 'Happy New Year' wen cultists kill am"
Wike say di action of Governor Okorocha na proof say wetin di intelligence dem get say APC plan to grant amnesty to wanted cultist for political reasons na true. Im come vex for APC to dey do politics with security mata wey no good at all for di rest of di country. Governor Wike say: "Di amnesty wey Governor Okorocha offer no cover Rivers State. Dis criminal cultist still dey wanted for dia crime against Rivers State and her people. 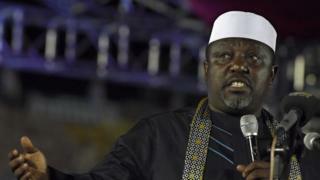 "Before Governor Rochas Okorocha grant di amnesty to di people wey kill our people, im no fit call me?... Weda you be PDP or APC, dia is no need to politicise security."